Meeting Between Pope And Russian Orthodox Patriarch Will Be 'First In History' : The Two-Way The Vatican and the Moscow Patriarchate say it's the first meeting between leaders of the two churches, which split in the 11th century. For the first time since their churches split in the 11th century, Pope Francis and Russian Orthodox Patriarch Kirill will meet in person. They're seen here in photos from earlier this year. 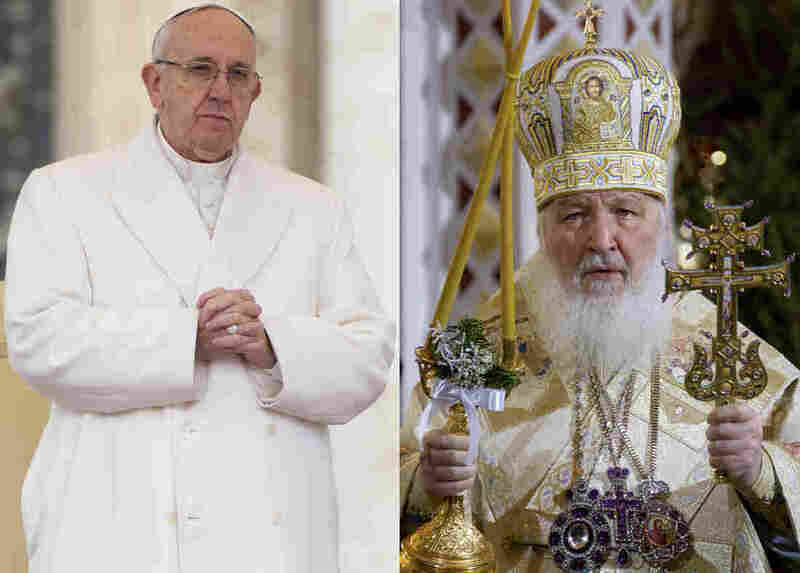 The pope and the head of the Russian Orthodox Church will meet next week in Cuba for a two-hour session that the Vatican and the Moscow Patriarchate say would be "the first in history" — the churches split in the Great Schism of 1054. The historic meeting between Pope Francis and Patriarch Kirill is set for Feb. 12. It's the result of an "intersection of the itineraries" as both leaders will be visiting Latin America next week, the Russian Orthodox Church says. Patriarch Kirill will be visiting President Raul Castro in Cuba, where "Pope Francis will make a previously unscheduled stopover on his way to Mexico for a six-day visit," as NPR's Sylvia Poggioli reports. "In the past, popes had met with the Istanbul-based ecumenical patriarchs. But their roles are mostly symbolic," Sylvia reports for today's All Things Considered. "The much more powerful Russian Orthodox Church — representing two-thirds of the world's 225 million Orthodox Christians — has been estranged for centuries from Rome." The two religious leaders are expected to meet in person, along with Castro, at Havana's José Martí International Airport. The plan calls for them to speak for two hours and sign a joint declaration. In a joint statement, the Holy See and the Moscow Patriarchate said the meeting "will mark an important stage in relations between the two churches. The Holy See and the Moscow Patriarchate hope that it will also be a sign of hope for all people of goodwill. They invite all Christians to pray fervently for God to bless this meeting, that it may bear good fruits." A similar attempt 20 years ago failed. The churches say the planned meeting between Francis and Kirill comes after "a long preparation" — a term that could be seen as including intense negotiations in 1996 and 1997 that would have brought Patriarch Alexy II and Pope John Paul II together in Austria, the Russian Orthodox Church says. But that agreement unraveled. "The two churches have remained estranged over the primacy of the pope," Sylvia says, "and Russian Orthodox accusations that Catholics are poaching converts in Russia."